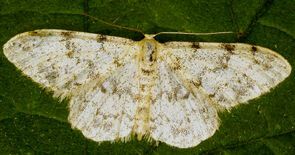 This 'Nationally Scarce A' species, which is only found in north Wales, has only been recorded once at Pistyll Rhaeadr on the northern edge of the county in 2005. Wingspan : M & F, 20-21mm. Mostly heather, but has also been found on crowberry and navelwort. Overwinters as a part grown larva amongst the foodplant. Larva August-May. Pupates in a fragile cocoon.